Anderson Heating & Air Conditioning, established in 1972, is a second generation business that offers fast and friendly home and small commercial installation of all your heating, cooling, and comfort needs. We service all brands! If you need a new system, Anderson Heating & Air Conditioning installs Amana and Goodman brand furnaces and air conditioners. Anderson services the greater Rapid City area including Black Hawk, Box Elder, and Summerset, SD. mechanical contractor and fully insured. Install both 80% standard and 96% high efficiency furnaces based on the customer’s current installation requirements and budget. Mike recommends 96% efficiency furnaces for heating in the cold South Dakota winters for long term savings and comfort! We repair any brand of central air conditioners. 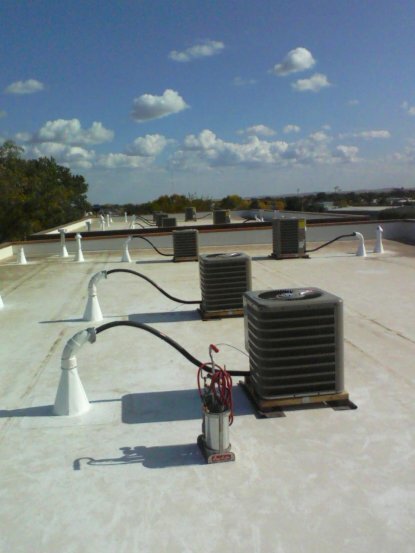 If your air conditioner cannot be repaired, we install 13 or higher SEER rated air conditioners to provide optimal comfort in those hot summer months in Rapid City and to save you money with lower electric bills year after year! Whole house humidifiers are a great idea in the Rapid City area, especially in the winter months when you are shocked by everything you touch! This is a great product that can be added to an existing furnace or installed with your new one. Install duct systems for new homes as well as duct additions for remodel projects! Want the ultimate in luxury, have Mike install a hanging garage heater in your garage. There is nothing nicer than getting into a warm car in January! Do you need specific areas heated or cooled instead of the whole house? Maybe a cold room or sunroom needs its own heating or cooling system! Let Anderson install ductless mini split system that heats or cools specific rooms in the house.